Hydrite Advanced Resins (HAR) is a new company formed from the combined resources of Hydrite Chemical Co and the technologies of Polymers 2000 Ltd. 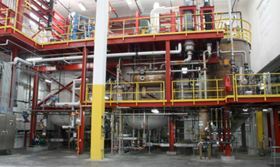 In March, HAR commissioned a major expansion at Hydrite Chemical Co.’s facility near Madison, Wisconsin, including twin 12 500 gallon reactors custom designed for the manufacture of epichlorohydrin derivatives, including speciality liquid epoxy resins. The HAR equipment is housed in a new custom designed process building adjacent to Hydrite Chemical’s Organic Processing site. Hydrite Chemical serves as the toll (contract) manufacturer for HAR in providing all manufacturing and support services in the production of HAR’s epoxy resins and other epichlorohydrin derivatives. Hydrite Chemical Co. is a diversified chemical company with 10 North American locations including the Cottage Grove site.